BY CAPT. C[ORNELIUS]. T[ACITUS]. ALLEN (COMMANDER OF ARTILLERY), MEXICO, MO. 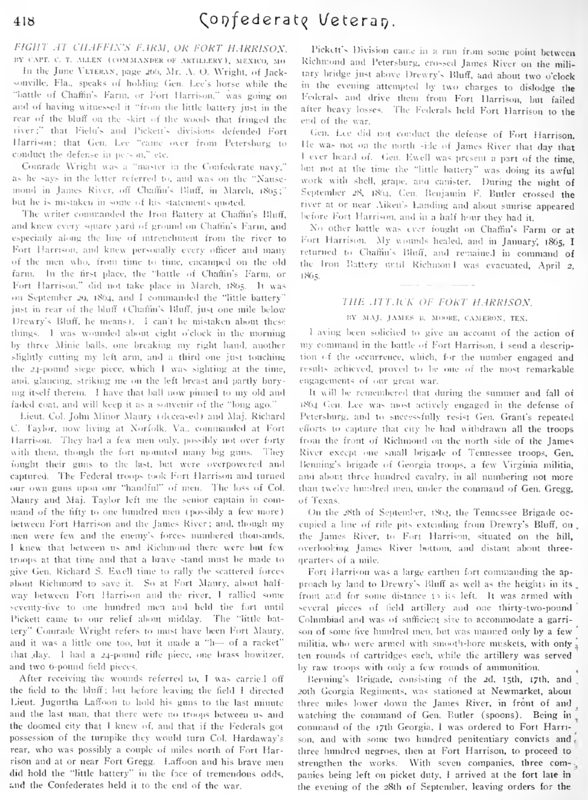 In the June VETERAN, page 266, Mr. A. O. Wright, of Jacksonville, Fla., speaks of holding Gen. Lee’s horse while the “battle of Chaffin’s Farm, or Fort Harrison,” was going on and of having witnessed it “from the little battery just in the rear of the bluff on the skirt of the woods that fringed the river,” that Field’s and Pickett’s divisions defended Fort Harrison; that Gen. Lee “came over from Petersburg to conduct the defense in person,” etc. Comrade Wright was a “master in the Confederate navy,” as he says in the letter referred to, and was on the “Nansemond in James River, off Chaffin’s Bluff, in March, 1865,” but he is mistaken in some of his statements quoted. After receiving the wounds referred to, I was carried off the field to the bluff, but before leaving the field I directed Lieut. Jugurtha Laffoon to hold his guns to the last minute and the last man, that there were no troops between us and the doomed city that I knew of, and that if the Federals got possession of the turnpike they would turn Col. Hardaway’s rear, who was possibly a couple of miles north of Fort Harrison and at or near Fort Gregg. Laffoon and his brave men did hold the “little battery” in the face of tremendous odds, and the Confederates held it to the end of the war. Pickett’s Division came in a run from some point between Richmond and Petersburg, crossed James River on the military bridge just above Drewry’s Bluff, and about two o’clock in the evening attempted by two charges to dislodge the Federals and drive them from Fort Harrison, but failed after heavy losses. The Federals held Fort Harrison to the end of the war. Gen. Lee did not conduct the defense of Fort Harrison. He was not on the north side of James River that day that I ever heard of. Gen. Ewell was present a part of the time, but not at the time the “little battery” was doing its awful work with shell, grape, and canister. During the night of September 28, 1864, Gen. Benjamin F. Butler crossed the river at or near Aiken’s Landing and about sunrise appeared before Fort Harrison, and in a half hour they had it. No other battle was ever fought on Chaffin’s Farm or at Fort Harrison. My wounds healed, and in January, 1865, I returned to Chaffin’s Bluff, and remained in command of the Iron Battery until Richmond was evacuated, April 2, 1865.